Chatime has teamed up with AirAsia for three years to serve the world’s first and only in-flight bubble tea. The beverage will be prepacked and sold on board AirAsia flights with the airline code AK, to be available to 48 destinations including Hong Kong, Bangkok and Clark.The beverage have been available on board the flights since July 1 and come in two flavours. “We see a lot of similarities between us and AirAsia – as both brands are fun, energetic, gutsy and adventurous which always dare-to-be-different and constantly pushing the impossible boundaries,” said Bryan Loo (pictured left), managing director of Chatime Malaysia. “It is Chatime and AirAsia’s lifelong mission to continue to surpass the expectations of our consumers and implement concepts that are unheard of, which is why following this partnership, we will embark on a journey that will forever change the airline experience for everyone,” Loo added. 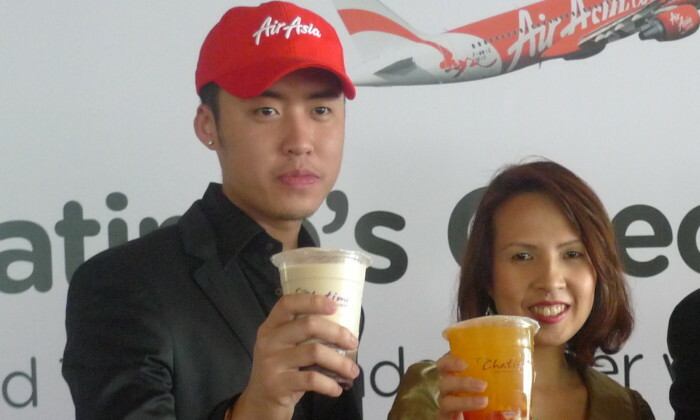 “Besides giving everyone the opportunity to fly, we are now bringing Malaysia’s most loved and popular beverage, Chatime, onto our array of menu items, which we are constantly improvising and innovating to suit the taste of the millions of guests who fly with us,” said Shireen Chia (pictured right), regional head, catering and in-flight business of AirAsia. Chatime has been creating social media buzz around the partnership and beverage availability via its Facebook page. This partnership marks Chatime’s second after partnering with BLoyalty’s BCARD in bringing its consumers its loyalty programme. The pronunciation of both characters sounds like PHD, and embodies the agency’s core product offering and values, it said in a rel..